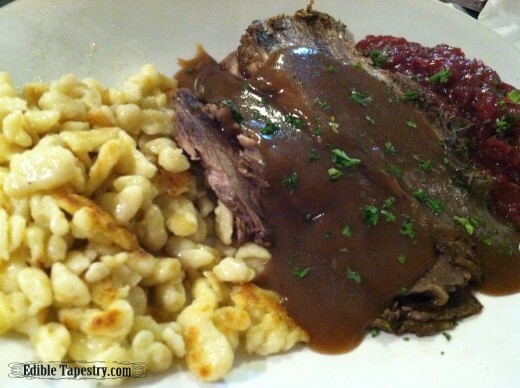 Though I grew up eating many different kinds of German food, spätzle is a Bavarian specialty that I wasn’t introduced to until I was in my 30s. It only took one bite. 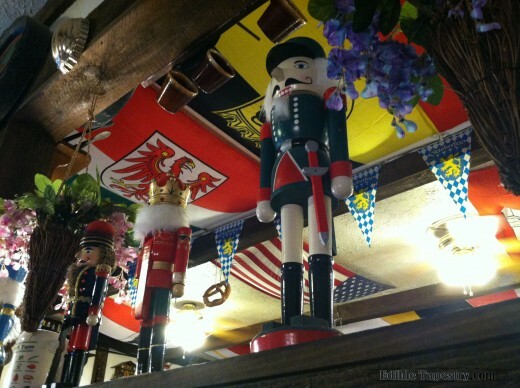 Now I find that I must have a pile of them with the annual German dinner my family travels to the mountains of North Georgia to indulge in this time of year. 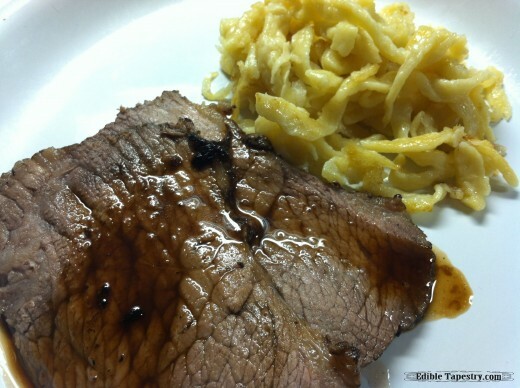 Spätzle, sauerbraten, and red cabbage. 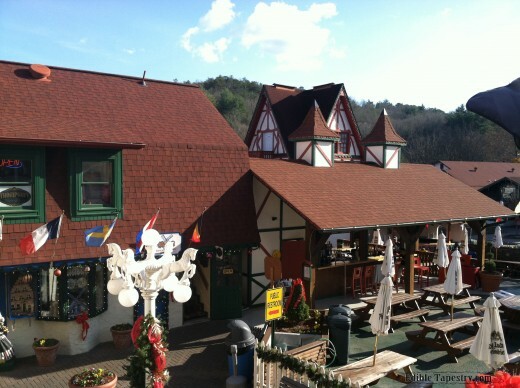 Old Bavaria Inn ~ Helen, GA.
North Georgia mountains?, you may ask. Yes. 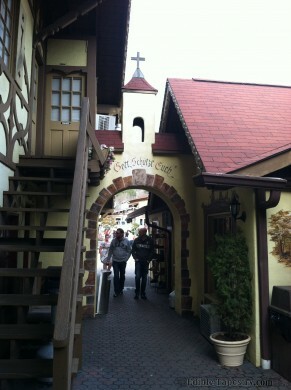 Where the quaint little town of Helen was transformed into an Alpine oasis in the 1960s when local entrepreneurs searched for a way to revitalize their town. I started visiting with my family at the age of ten, just over a decade after the town was remade, and have been taking my children each Christmas to buy advent calendars since they were toddlers. 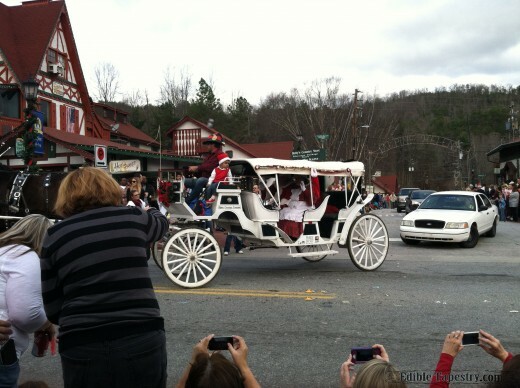 This year, we pulled into town just as the Christmas parade was about to start. Am I the only one who has to resist the urge to yell, “Santa! Santa! I know him! 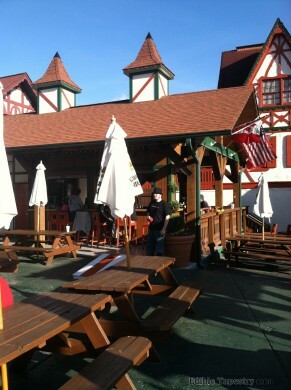 I KNOW him…” Will Ferrell style, anytime I see the big man in red? I’ve been “needing” my German noodles a little more often than usual, this year. I’ve been making a lot of them since the middle of summer. 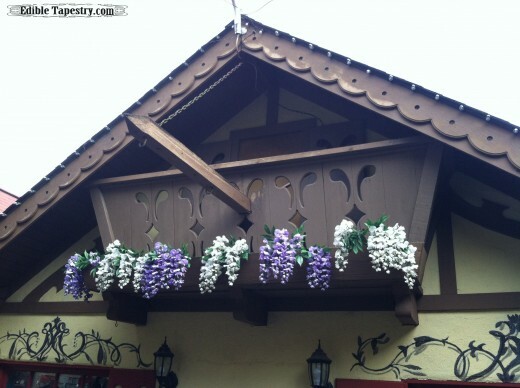 I don’t know what got into me, but there I’d be, mixing more flour for spätzle. And it shows. On my hips, thighs, stomach, and behind! I do not recommend adding a noodle obsession to an ongoing red and purple potato mania, as I did this past summer. It’s just not a good idea. 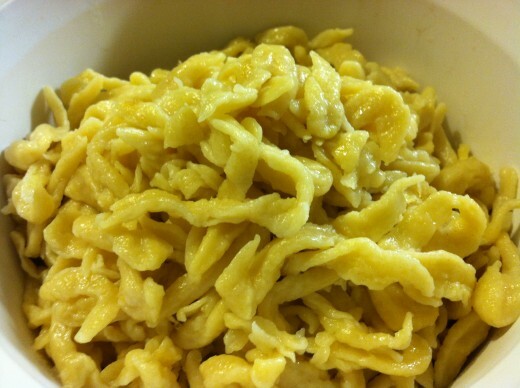 Spätzle are extremely easy to make and so worth the flour dusted mess…that kind of spreads and spreads…just…all over the place. Worth it. I don’t think there’s a single good thing about them, nutritionally speaking, but when the sun is starting to set behind the mountains, and whatever hunk of meat is just about done roasting in the oven, it just feels like there is nothing else I should be doing but working up some noodle dough. Here is how I’ve been doing it. 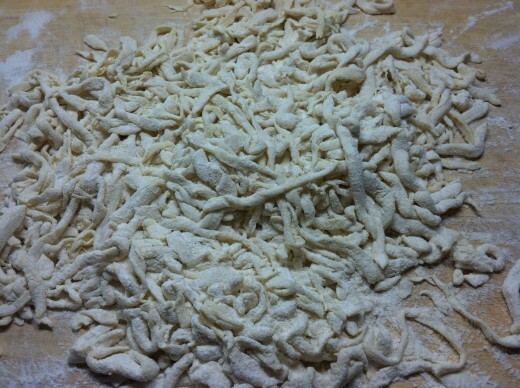 Lots of extra flour for rolling and cutting. LOTS! Sift together the flour and the salt in a medium sized mixing bowl. 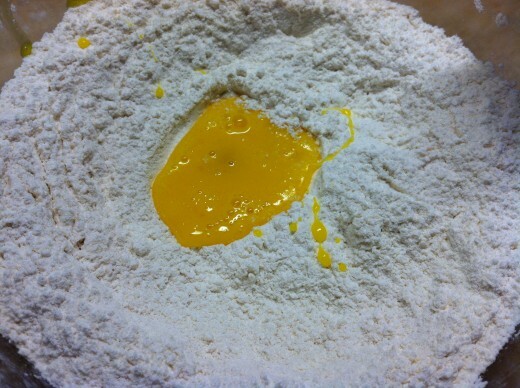 Drizzle in a little water at a time until a smooth dough is formed. Allow it to rest while a pot of water is set to boil. Fill a large stock pot with a few quarts of water. Salt it. Bring it to a boil. Place a colander over a mixing bowl to drain the boiled noodles when they are finished. Keep it in reach of the stove, along with a serving platter, a perforated spoon, and a spatula. Things start moving very quickly once the noodles are placed in the boiling water, and there just isn’t time to run around gathering equipment. 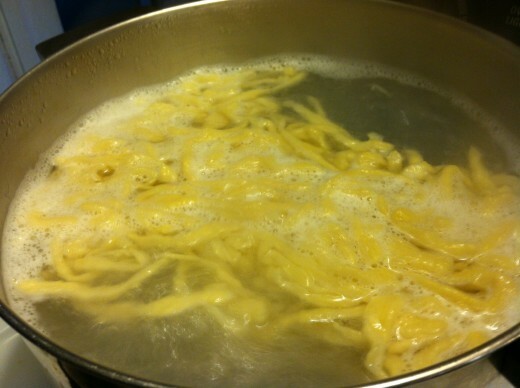 Get a large skillet ready on another burner for frying the spätzle as soon as they drain in the colander. 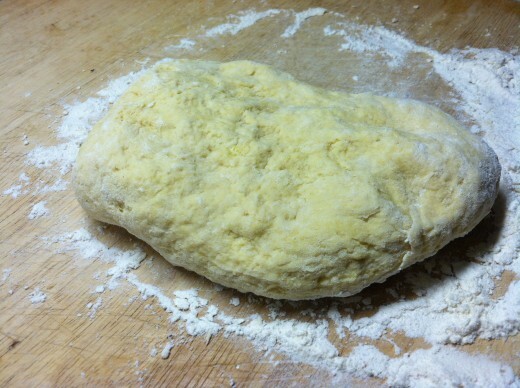 Roll the dough on a generously floured surface to around 1/4″ thick. 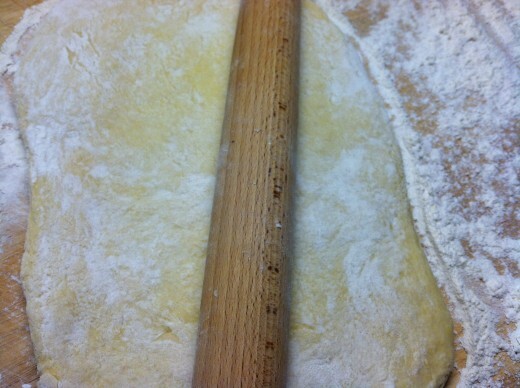 Take a large chef’s knife and scrape bits of dough from the main rolled portion. 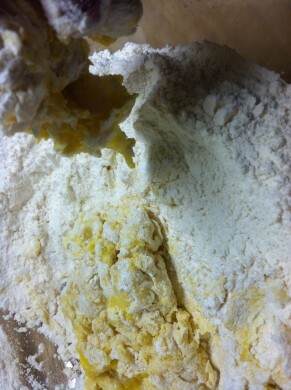 Toss the bits in flour to keep them from sticking together. Be prepared to use a lot of flour, even re-dusting if necessary. Make sure that the water in the stock pot is coming to a boil. 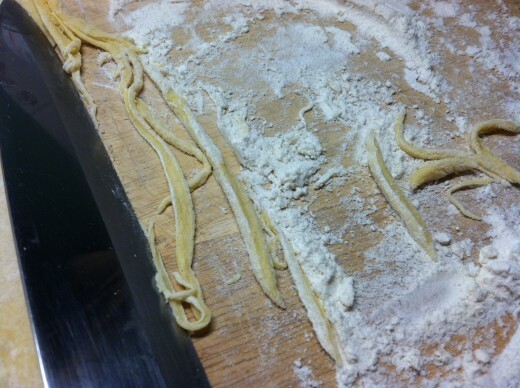 When all the dough has been scraped into noodles and the noodles have been generously dusted in flour, sift them through your fingers a bit to remove any excess flour. Add them a cup, or so, at a time to the boiling water in the pot. Turn the heat on under the skillet to around medium. 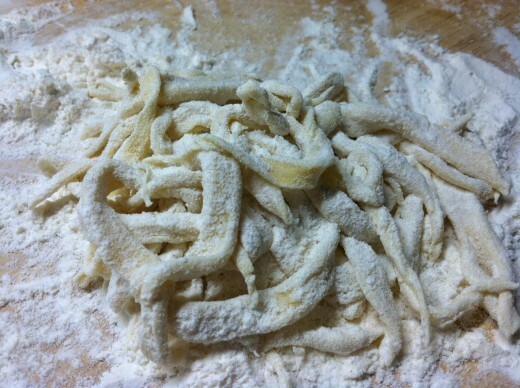 Add a couple of tablespoons of butter to ready it for frying the noodles which boil very quickly. 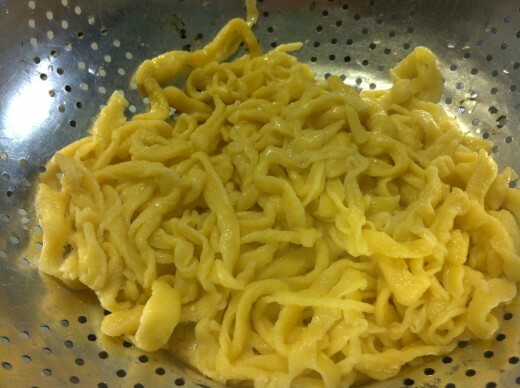 When the spätzle come to the surface, strain them out of the water with a perforated spoon and place them in the colander. 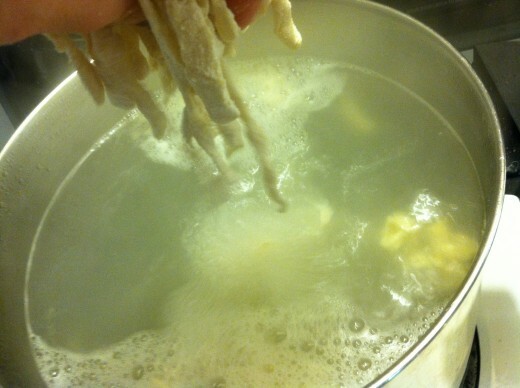 Add another handful of noodles to the boiling water. 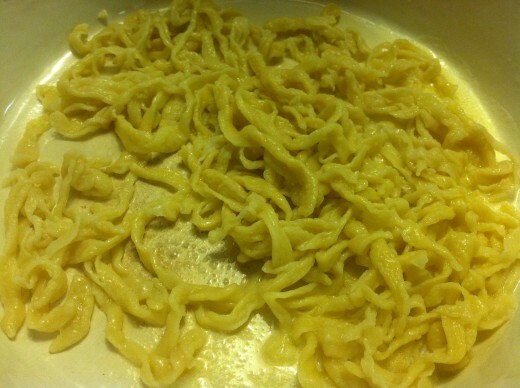 If the skillet is hot enough at this point, and the butter is melted, toss the drained noodles into the skillet to fry them. They are better if they brown a little, but be careful not burn them. Add butter as needed and keep them moving with a spatula. 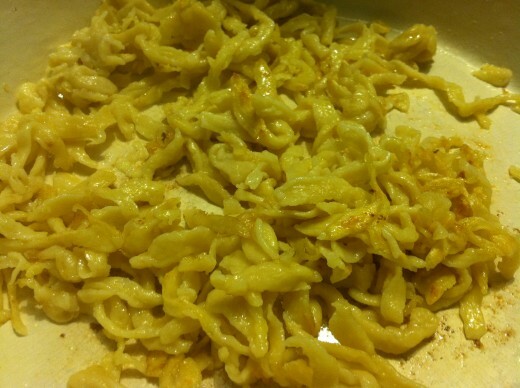 Transfer the sautéed spätzle to the serving bowl or platter. 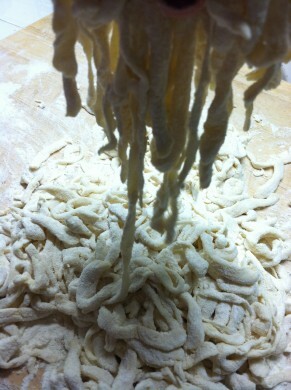 Repeat the process until all the dough has been boiled and sautéed.